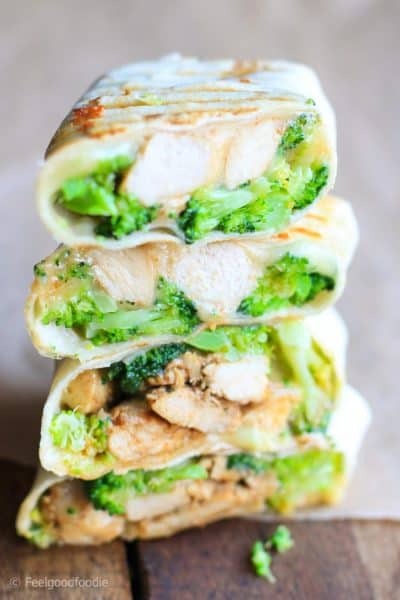 These Cheesy Chicken and Broccoli Wraps are da bomb! They're super easy to prepare, only need a few ingredients and are certainly a family favorite! Chicken and Broccoli – hello fabulous duo! 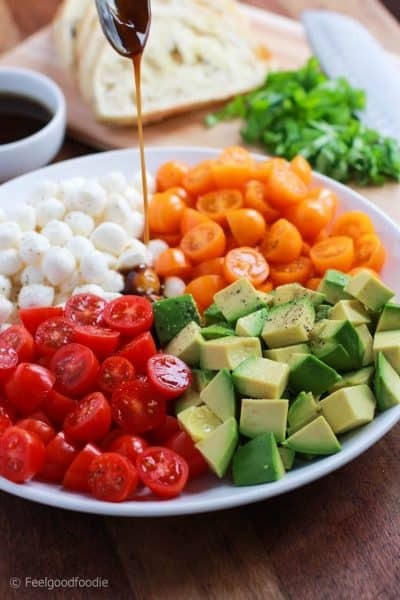 Put them together in a wrap with melted cheesy goodness and you’re golden baby! These wraps are so easy to make. All you need are your favorite tortilla wraps, chicken (if you’ve got some leftover, it’s makes it even faster! ), broccoli and cheese essentially. I love putting these in the panini so I can get those beautiful grill marks. But you can also use a grill pan or even just a toaster oven to get a nice crispy wrap on the outside. 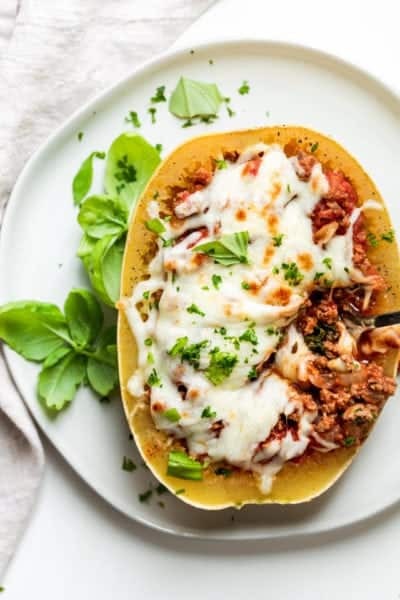 So cheesy, so easy, so yummy! 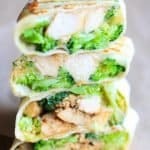 If you’ve tried this healthy-ish feel good Chicken and Broccoli Wraps recipe or any other recipe on FeelGoodFoodie, then don’t forget to rate the recipe and leave me a comment below! I would love to hear about your experience making it. And if you snapped some shots of it, share it with me on Instagram so I can repost on my stories! Heat olive oil in a medium skillet over medium heat. Season chicken thighs with onion powder, garlic powder, oregano, paprika and salt and pepper to taste. Add chicken to the skillet and cook until golden, about 3-4 minutes; set aside. In a steamer set over boiling water, steam broccoli, covered, until crisp-tender, 4-5 minutes. In the center of each tortilla wrap, spread the sour cream evenly, then add the chicken, broccoli and cheese. Bring the bottom edge of the wrap tightly over the filling, folding in the sides, then roll until you each the top of the wrap. These cheesy chicken wraps look so simple and delicious, perfect for lunchtime!